This review article discusses the current scenario of the national and international burden due to lymphatic filariasis (LF) and describes the active elimination programmes for LF and their achievements to eradicate this most debilitating disease from the earth. Since, bioinformatics is a rapidly growing field of biological study, and it has an increasingly significant role in various fields of biology. We have reviewed its leading involvement in the filarial research using different approaches of bioinformatics and have summarized available existing drugs and their targets to re-examine and to keep away from the resisting conditions. Moreover, some of the novel drug targets have been assembled for further study to design fresh and better pharmacological therapeutics. Various bioinformatics-based web resources, and databases have been discussed, which may enrich the filarial research. Background & objectives: Since Aedes aegypti was identified as vector of yellow fever and dengue, its dispersal is relevant for disease control. We studied the dispersal of Ae. aegypti in temperate areas of Argentina during egglaying, using the existing population and egg traps. Methods: Two independent replicas of a unique experimental design involving mosquitoes dispersing from an urbanized area to adjacent non-urbanized locations were carried out and analyzed in statistical terms. Results: We found relationship between stochastic variables related to the egg-laying mosquito activity (ELMA), useful to assess dispersal probabilities, despite the lack of knowledge of the total number of ovipositions in the zone. We propose to evaluate the egg-laying activity as minus the logarithm of the fraction of negative ovitraps at different distances from the buildings. Interpretation & conclusion: Three zones with different oviposition activity were determined, a corridor surrounding the urbanization, a second region between 10 and 25 m and the third region extending from 30 to 45 m from the urbanization. The landscape (plant cover) and the human activity in the area appear to have an influence in the dispersal of Ae. aegypti. The proposed method worked consistently in two different replicas. Background & objectives: Development of insect resistance to synthetic pesticides, high operational cost and environmental pollution have created the need for developing alternative approaches to control vector-borne diseases. In the present study, larvicidal activity of flavonoid extracts of different parts of Vitex negundo (Linnaeus) and Andrographis paniculata (Nees) have been studied against the late III or early IV instar larvae of Aedes aegypti and Anopheles stephensi (Liston). Methods: Flavonoids were extracted from different parts of the selected plants using standard method. Bioassay test was carried out by WHO method for determination of larvicidal activity against mosquitoes. Different compounds of the most active extract were identified by the gas chromatography-mass spectrometry (GC-MS) analysis. Results: Flavonoid extract of whole aerial part of A. paniculata was found to be inactive against the selected larvae of Ae. aegypti even at the concentration of 600 ppm, whereas it caused 70% mortality in An. stephensi at the concentration of 200 ppm. Flavonoid extract of flower-buds produced highest mortality (100%) at the concentration of 600 ppm for the late III or early IV instar larvae of Ae. aegypti and at the concentration of 200 ppm for the larvae of An. stephensi. GC-MS analysis of the most active flavonoid extract from flower-buds of Vitex showed 81 peaks. Phenol (26.83% area), naphthalene (4.95% area), 2,3-dihydrobenzofuran (6.79% area), Phenol-2,4-Bis (1,1-dimethyl) (4.49% area), flavones 4'-OH,5-OH,7-di-O-glucoside (0.25% area) and 5-hydroxy- 3,6,7,3',4'-pentamethoxy flavones (0.80% area) were present in major amount. Conclusion: Flavonoid extracts from different parts of two selected plants possess larvicidal activity against two selected mosquito species, hence, could be utilized for developing flavonoid-based, ecofriendly insecticide as an alternative to synthetic insecticides. Background & objectives: Leishmaniasis as a dynamic disease may be markedly influenced by demographic and ecological factors. A geospatial information system study was developed to determine the distribution of visceral leishmaniasis (VL) cases in relation to population, climatic and environmental factors in Fars province, southwest of Iran. Methods: The dwelling addresses of 217 VL patients were obtained from hospital files. A hazard map produced by unifying buffers (5 km) around nomads travel routes (NTR) was developed to survey the effect of close proximity to NTR on the distribution of VL. Mean annual rainfall (MAR), mean annual temperature (MAT), four months temperature mean (T4), elevation, slope and landcover were climatic and environmental factors that have been analysed. Finally, data of dwelling foci were extracted from maps and analysed using logistic regression models. Results: Close proximity to NTR was the most important factor influenced on the disease distribution. Climatic factors were in second rank. Among them, temperature especially T4 is the most effective variable and rainfall was also shown to be another effective climatic agent. Most cases of VL were reported from temperate and semiarid areas in western and central regions while arid condition was a confined factor. The environmental factor of landcovers including urban, dry farm and thin forest regions was revealed as the third rank effective factor. Altitude importance was only shown when its effect was studied independently from other factors. Interpretation & conclusion: These findings present the distribution of VL in Fars province is influenced by combination of ecological and nomads demographical variables although closeness to NTR and nomads role in distribution and continuance of kala-azar are the most important factors. Background: Dengue virus infection has recently taken endemic proportions in India with dengu type-3 (DEN-3) as a predominant serotype. In this study, we carried out the selection pressure analysis of three critical immunogenic regions of DEN-3. Phylogenetic analysis was then carried out on the positively selected genomic region in the DEN-3 virus strains isolated in the Indian subcontinent over a time span of 25 yr (1984-2008). Bayesian Markov chain Monte Carlo (MCMC) calculation of the substitution rate was carried out for the DEN-3 genotype-III sequences. Methods: Sequences corresponding to the C-prM, E-NS1 and NS1 sequence regions of DEN-3 strains were taken for the positive selection analysis. The C-prM junction sequences were then used to construct a maximum likelihood (ML) phylogenetic tree. Substitution rates were also calculated under various models of population growth. Results: It was found that codon 86, corresponding to a conserved arginine residue in a crucial T-cell epitope of the C-protein was under significant positive selection. The K86R substitution was found to exist in almost all the Indian strains isolated after 2004. The ML tree constructed from the C-prM junction sequences indicated that strains from the 2006 dengue incidences in Delhi, namely: 04/03/del2006, 05/03/del2006, and 06/03/del2006 were the most rapidly evolving. Substitution rates of a DEN-3 genotype-III sequences from the Indian subcontinent were found to be ~3.0 times higher than those reported from other parts of the world. Conclusion: Positive selection in the codon corresponding to R86 of the highly conserved surface C-protein is important in view of its occurrence in a T-cell epitope as well as its strict conservation in all the DEN strains. Phylogenetic analysis of the C-prM junction sequences showed that three strains of 2006 are rapidly evolving. These results were also supported by calculations of the substitution rates. Their significance in the expansion of viral epidemics requires to be investigated. Background & objectives: The search for effective polymorphic markers in Plasmodium vivax is highly demanding to understand its transmission in a population. Due to the limited knowledge existing for P. vivax, the search for polymorphic markers for population studies is ongoing. The MSP gene family of Plasmodia has been linked with immune evasion. To study the circulating parasite population P. vivax merozoite surface protein 3β (PvMSP3β) polymorphic marker was used to investigate the genetic diversity of P. vivax in natural infections. Methods: Polymorphism of PvMSP3β gene was determined in 46 P. vivax blood samples from six different regions of India by polymerase chain reaction (PCR) and restriction fragment length polymorphism (RFLP) with PstI. Results: Two different parasite genotypes, viz. type-A and type-B were detected among 46 samples that were positive for PCR, based on the size of the amplification. RFLP analysis with PstI showed 22 allelic groups and 15.2% samples revealed mixed infections on analysis. Conclusion: PvMSP3β was found to be an effective molecular marker for P. vivax as it shows high diversity in India and multiple genotypes easily distinguishable without the need for sequencing. Background & objectives: Aedes albopictus has been known as efficient vector of dengue in Asian countries and its wide displacement of Ae. aegypti has been documented in many parts of the world. The present survey was carried out to update the distribution of Ae. albopictus in northeast Mexico and to report the first record of parasitism of mosquitoes by Ascogregarina taiwanensis in Mexico. Methods: Human landing collections were conducted in the month of May every year between 2007 and 2009 across the three states, Nuevo Leon (NL), Tamaulipas and Coahuila in northeast Mexico. Six human bait collections were also organized at the cemetery of Gomez Farias (GF), a village in southern Tamaulipas during the rainy and dry seasons in 2010. Aedes albopictus caught in 2010 were dissected for parasitic protozoan gregarines. Results: The results of human landing collections carried out during 2007-10 across the three states of northeast zone of Mexico revealed that Ae. albopictus is invading along the route between Monterrey City in NL and Tampico, Tamaulipas, but not into the arid state of Coahuila. Aedes albopictus was recorded in nine new municipalities in addition to the 15 municipalities reported before 2005. Furthermore, six human-bait collections performed during the dry and rainy seasons in 2010 at the cemetery of GF suggest the exclusion of Ae. aegypti on that site. Dominance was shared by Ae. quadrivittatus, another container-inhabitant but indigenous species, and Ae. albopictus during the dry and rainy seasons, respectively. The results of dissection of the mosquitoes for gregarines revealed the parasitism of Ae. albopictus by A. taiwanensis. Interpretation & conclusion: The results of this study showed that Ae. albopictus has spread to all the municipalities in the northeastern Mexico except the arid area and reported the first record of parasitic protozoan A. taiwanensis in Mexico. We recommend further studies on larval and adult populations of natural container-occupant mosquitoes in northeastern Mexico in order to have a better documentation of the impact of Ae. 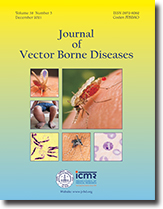 albopictus upon the indigenous species community, and its epidemiological role in dengue transmission. Background & objectives: Insecticide resistance in mosquitoes at Kinshasa may jeopardize the efficacy and usage of long-lasting insecticidal nets (LLINs). Entomological impact, user acceptance and bioefficacy of a combination LLIN (PermaNet ® 3.0) and a standard LLIN (OlysetNet ® ) were evaluated at two sites in Kinshasa characterized by high densities of either Anopheles gambiae s.s. (Kindele) or Culex spp (Kimbangu). Methods: Insecticide susceptibility (permethrin, deltamethrin, bendiocarb, propoxur and DDT) was determined via tube tests and bottle assays. Entomological impact of unwashed and washed LLINs and untreated nets was assessed via Latin square, based on rotation of nets and their users through selected houses at each site. User acceptability was evaluated through interviews using a questionnaire and net bioefficacy was measured via cone bioassays with field-derived An. gambiae s.s. Results: The An. gambiae s.s. population from Kindele was resistant to DDT and permethrin with mortality rate of 27.3 and 75.8%, respectively, and kdr mutations (L1014F) plus suspected metabolic resistance. The Culex spp population was resistant to all five insecticides tested. No differences in entomological indices were observed for the five net treatments, but bioefficacy against An. gambiae was significantly higher for unwashed and washed PermaNet 3.0 (100 and 71% mortality) than for OlysetNet (56 and 36%). Householders reported a good sleep most often when using unwashed and washed PermaNet (94 and 88%) and least often with unwashed OlysetNet (46%). Interpretation & conclusion: High bioefficacy via cone bioassays against an An. gambiae s.s. population with kdr and suspected metabolic resistance was observed with PermaNet 3.0. Lower biting rates and a higher chance of a good night of sleep were reported when using PermaNet 3.0 compared to OlysetNet. Background & objectives: Container-breeding mosquitoes, especially Aedes spp are vectors of diseases such as dengue and chikungunya. The abundance of these disease vectors in an area depends on the availability of container habitats and their physicochemical characteristics. The species composition of container-breeding mosquitoes in Asom, India was studied and the larval density was correlated with the habitat characteristics. Methods: Natural and man-made water-holding containers in Sonitpur district of Asom were surveyed for the presence of mosquito larvae. The percent composition of container-breeding mosquitoes and container index were calculated. The physicochemical characteristics of breeding water such as pH, conductivity, salinity, total dissolved solids, turbidity and dissolved oxygen were measured. Results: Aedes albopictus (93.7%) was the predominant species in the container-breeding habitats whereas Culex quinquefasciatus (2.77%), Armigeres subalbatus (2.26%), Ae. aegypti (0.76%), Toxorhynchites sp (0.4%) and Lutzia sp (0.11%) were recorded in relatively low numbers. The larval density (mean ± SEmean) of the container breeding mosquitoes ranged from 4.4 ± 1.8 to 15.4 ± 8.2, while the container index ranged from 1.58 to 5.68%. The mean (± SEmean) pH, conductivity, salinity, total dissolved solids, turbidity, and dissolved oxygen of water in the container habitats were 7.15 ± 0.11; 396.1 ± 58.5 μS/cm; 0.24 ± 0.04 ppt; 207.1 ± 30.4 mg/l; 32.3 ± 5.1 NTU; and 1.42 ± 0.12% respectively. The mosquito larval density in the container habitats was having significant negative correlation with the conductivity of breeding water (r = - 0.89; p = 0.003). Salinity, total dissolved solids and turbidity of water in the habitats were negatively correlated, whereas pH and dissolved oxygen were positively correlated with the larval density. Interpretation & conclusion: The studies indicated the predominance of Ae. albopictus in the container-breeding habitats and reiterated its importance as a potential vector of dengue and chikungunya in the region. The spread of Ae. aegypti, the principal vector of dengue, in the semi-urban areas probably through road transport is a matter of public health concern. The use of conductivity of breeding water as an index for the proliferation of container breeding mosquitoes in the region could be explored further. Background & objectives: The relationship between altitude, temperature and malaria are poorly understood. Hence, a study was undertaken at three sites of Udham Singh Nagar (erstwhile Nainital district) and Nainital district (Uttarakhand) during 2010– 11 for the generation of evidences in the context of potential threat of climate change. Methods: Data on temperature and relative humidity (RH) were recorded through data-logger device in study villages at the altitudes of 166, 226 and 609 m were selected for detailed work. Mosquito collections were made fortnightly during 0600– 0800 hrs. Malaria incidence data were procured from concerned Primary Health Centres. Results: The study provides evidences of decrease in temperature with increase in altitude, even within a district resulting in variation in temporal distribution of malaria vector. With the increase of 67 m altitude between plains and foothill village, there was a reduction in temperature to the tune of 1.1°C and with further increase in altitude of 416 m between foothill and hilly villages, the temperature decreased by 0.27°C. The difference in temperature at three altitudes affects the Transmission windows (TWs) of both Plasmodium vivax (Pv) and P. falciparum (Pf), and opening of TWs are inversely proportional to altitude. In the plains, the TW for Pv and Pf were open for 11 and 10 months respectively, while 10 and 9 months in the foothills and 9 and 8 months, respectively for both the parasites at hilly altitude. Comparison of malaria vectors in plains, foothills, and hilly villages showed that the availability of Anopheles culicifacies and An. fluviatilis decreased with an increase in altitude from foothills to hilly areas. Interpretation & conclusion: This study may be extrapolated to know the suitability of occurrence of malaria vectors and transmission of parasites at different altitudes from the viewpoint of temperature as limiting factor in unknown areas.